40 years ago Birmingham Friends of the Earth moved into our building, the Warehouse, spending the first few days moving bags of rotting lentils. They had a vision of what this former Victorian warehouse could achieve, and over the past 40 years it has been the base for all of our activity – housing everything from practical recycling and home insulation projects to the current mix of meeting and office space and green and community businesses. At the start of April we celebrated our 40th birthday with a big party, welcoming many friends from the past who are all part of the Warehouse story. Since my involvement with BFOE I’ve seen the building change a lot, and I’ve done my share of painting walls and stripping floors. I think that was the case for a lot of people at the party; we each leave our mark on the building in our own way, and the building leaves its mark on us. When we talk about the Warehouse we aren’t just talking about a building; we’re talking about everybody that has been part of it and make it what it is. We’re the only Friends of the Earth group to own our own building and we are immensely proud of everything we’ve achieved over the past 40 years, but we know that we can do so much more. We want that to just be the beginning of our story. It was really important to us that the party wasn’t just looking back but it was looking to the future as well. To stay relevant over the past 40 years we’ve constantly had to evolve and react to a changing world. We know that now we need to change to deal with the challenges of the next 40 years. That’s why at our 40th birthday party we launched our community share offer to transform the Warehouse into a 21st century building that can achieve its true potential. We plan to transform the building into a practical example of energy-efficient eco-renovation in action, with full disabled accessibility and the space that our social enterprise and charity tenants need to grow. 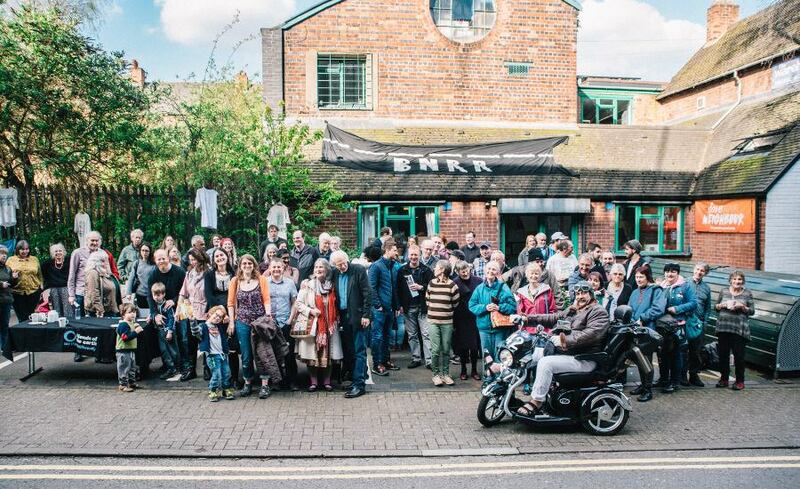 We hope to demonstrate a community-led form of regeneration which works with existing buildings and local people rather than tearing them down. That’s been our dream for a long time and we’ve finally got an opportunity to make that dream come true. But we can’t do it on our own. We are asking our friends, old and new: if you believe in what we do, if you believe in taking local action to fight global injustice, if you believe that together we not only can create a better world but that we must – take this leap with us. Join us and be part of our transformational change. In April 2057, at our 80th birthday party, we can look back and know that we stood together and faced the future with courage and hope.